"4:44" redirects here. For the movie, see 4:44 Last Day on Earth. For the Charlie Major album, see 444 (album). Like Jay-Z's previous album, Magna Carta Holy Grail (2013), 4:44 was not preceded by any singles. The album was recorded from December 2016 to June 2017, and produced by No I.D., with additional contributions by Jay-Z himself. James Blake and Dominic Maker also contributed production to the album's bonus tracks. It features guest appearances from Frank Ocean, Damian Marley, Beyoncé and Jay-Z's mother, Gloria Carter. It also has additional vocal contributions from Blue Ivy Carter, James Fauntleroy, Kim Burrell and The-Dream. The album was acclaimed by critics, who praised its emotional and personal content. On July 5, the album was certified Platinum by the Recording Industry Association of America (RIAA), in recognition of one million copies purchased by Sprint and offered to consumers as free downloads. It debuted at number one on the US Billboard 200, making it Jay-Z's 13th consecutive studio album to top the chart, and 14th overall. The album spawned three singles, the title track "4:44", "Bam" and "Family Feud", as well as several music videos, directed by a variety of high-profile collaborators. The album received a Grammy Award nomination for Album of the Year, while the title track was nominated for Song of the Year and "The Story of O.J." was nominated for Record of the Year at the 60th Annual Grammy Awards. In April 2016, Jay-Z's wife Beyoncé released her sixth studio album, Lemonade. Lyrically, it alleged that Jay-Z was unfaithful. In June 2017, 4:44 was teased after posters were displayed in New York City, Los Angeles and Miami as well as banner ads started appearing on the Internet. A one-minute teaser ad was aired during the NBA Finals on June 7 featuring actors Mahershala Ali, Lupita Nyong'o and Danny Glover, ending with "4:44 – 6.30.17, Exclusively on Tidal". On June 18, Father's Day, a clip titled "Adnis" was posted on Sprint's YouTube page. Adnis was Jay-Z's father's name. A second teaser trailer was released on June 27 titled, "Kill Jay Z", featuring a young man with a "Stay Black" T-shirt. A third one followed on June 28, titled "MaNyfaCedGod", featuring Lupita Nyong'o crying "hysterically" on the floor. No I.D. says Jay-Z approached him about working together, and initially declined. He cited feeling "uninspired" and "didn't think [he] had anything at the time". However, he researched Quincy Jones as inspiration to begin work with Jay-Z. No I.D. states he "began to play the samples like I would play an instrument." To get inspiration for 4:44, No I.D. pointed to albums such as What's Going On by Marvin Gaye, Confessions by Usher, The Blueprint by Jay-Z, Illmatic by Nas, and My Beautiful Dark Twisted Fantasy by Kanye West, saying he "analyzed the mistakes and tried not to make those mistakes." The album was largely recorded in No I.D. 's home studio in Hollywood. Its recording began in late December 2016, according to No I.D. It was finished shortly before the album's release. "4:44" was written when Jay-Z woke up one morning at 4:44 am, and recorded at his house using Beyoncé's microphone. 4:44 is a hip hop and conscious hip hop album. It contains samples from many genres, like funk, progressive rock, reggae and soul. These include Stevie Wonder's "Love's in Need of Love Today", The Clark Sisters's "Ha Ya (Eternal Life)", Donny Hathaway's "Someday We'll All Be Free", and Nina Simone's "Four Women" and "Baltimore". Elia Leight of Rolling Stone notes 4:44 is "sample-heavy at a time when so much of rap has moved away from that sound". Jay-Z and No I.D. created a playlist based on Jay-Z's taste, and sampled some songs of it in the album. Later, Jay-Z posted the playlist, titled 4:44 Inspired By, on Tidal. On the album, Jay-Z touches on a wide array of topics, such as the ongoing hip hop culture, his family life, his relationships, stereotypes and racism. Many critics have noted that 4:44 is a response to Lemonade, with Jay-Z referencing lines from the album. For example, the "You better call Becky with the good hair" line on Beyoncé's "Sorry", with Jay-Z retorting, "Leave me alone, Becky" in "Family Feud". However, No I.D. said that to make the entire album a response to Lemonade was not the intention. Instead, Jay-Z wanted to focus on an album "where I talk about the things that I've never talked about". "Kill Jay Z" is about "killing" his ego Jay Z (without hyphen), featured in his previous album Magna Carta Holy Grail. The song references his friendship with Kanye West, as well as an incident in which he shot his brother. He also references his rumored extramarital relationships. "The Story of O.J." references racism, stereotypes and the experience of being a black person in America. "Smile" discusses his mother being a lesbian, while featuring a poem from her. "Caught Their Eyes" references Prince; before his death, Prince befriended Jay-Z, giving exclusive streaming rights for his catalog to Tidal. "4:44", the album's title track, is "one long, tearful, soul-ripped-open apology" dedicated to Beyoncé. "Family Feud" is about a "separation within the culture" and "tensions in the black community and at home". The track also references his infidelity. The "reggae-tinged" song "Bam" features Damian Marley's vocals, with a four-piece horn section and guitar. Jay-Z said about the track: "it's just jammin', it's just like the song. But it's secretly Shawn Carter saying, 'Man, you need a bit of ego.'" "Moonlight" references two films nominated to the 2017 Oscars for Best Picture, Moonlight and La La Land, as a "commentary on the culture and where we're going". The album's title track, "4:44", was released as the lead single to rhythmic contemporary radio on July 11, 2017. The song from the album, "Bam", was released as the second single to rhythmic contemporary radio on September 26, 2017. The song "Family Feud" was released to British contemporary hit radio on January 26, 2018 as the album's third single. On July 10, Jay-Z announced the 32-date North American 4:44 Tour beginning on October 27 at the Honda Center in Anaheim, California. The tour concluded on December 21 at The Forum in Inglewood. Music videos were released for every song on the album except "Caught Their Eyes". An animated music video for "The Story of O.J." was uploaded on Tidal soon after the album's release. The video was directed by Mark Romanek and Jay-Z and shows a character named Jaybo, based off The Story of Little Black Sambo. This was followed weekly by "4:44" directed by TNEG, "Bam" directed by Rohan Blair-Mangat, "Kill Jay Z" directed by Gerard Bush and Christopher Renz, "Adnis" directed by Romanek, "Moonlight" directed by Alan Yang, and "MaNyfaCedGod" directed by Francesco Carrozzini. On November 24, three further videos were released: "Legacy" directed by Jeymes Samuel, "Smile" directed by Miles Jay and "Marcy Me" directed by Ben and Joshua Safdie. On December 29, a video for "Family Feud" was released, directed by Ava DuVernay and scored by Flying Lotus, followed on January 7, 2018 by "Blue's Freestyle", directed by Maurice Taylor of Artlife Studios. Jay-Z held listening parties for the album at participating Sprint stores on June 29, 2017. 4:44 was released as an exclusive to Tidal and Sprint subscribers on June 30, the first in a planned series of music exclusives from the Sprint–Tidal partnership. Through an iHeartRadio and Roc Nation partnership, 4:44 was played on a loop on various rap stations until July 1. Jay-Z provided song commentary via iHeartRadio upon the album's release. On July 7, a physical version of the album featuring three additional tracks was released, and the album was made available to other streaming platforms, such as Apple Music, Google Play Music and Amazon Music. 4:44 was released to acclaim from critics. At Metacritic, which assigns a normalized rating out of 100 to reviews from mainstream publications, the album received an average score of 82, based on 29 reviews. Many critics praised its emotional and personal content. Neil McCormik of The Daily Telegraph gave the album a perfect score, stating "It's a highly personal work bravely opening up the artist's very human flaws as an example to others, locating in his own suffering a path towards forgiveness, redemption and, ultimately, a better world. There is little braver than admitting your mistakes and trying to change your ways. By embracing vulnerability, Jay Z has taken a step towards genuine wisdom." Brittany Spanos of Rolling Stone called the album "a stunning, raw and mature apology that's as much an ode to partnership and family as it is an example of how vulnerability can make for truly excellent art." Spanos states "4:44" is "the most specific and touching" song on the album. 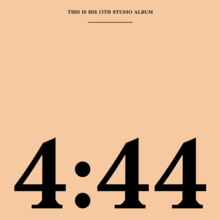 4:44 was named "Best New Music" by Pitchfork, with reviewer Sheldon Pearce writing, "The most crafty and evasive MC lays bare his complicated life. This late-career gem is personal and diamond-sharp, confronting the failings and legacy of Shawn Carter and America." He also calls the album a "historical artifact". 4:44 debuted at number one on the US Billboard 200 with 262,000 album-equivalent units, of which 174,000 were pure album sales. It is Jay-Z's 14th number one album to debut and peak atop the chart. The album was a Tidal exclusive for the 1st week and the streaming numbers on Tidal were not reported. During this period, it was reported that mobile company Sprint, a major share-holder in Tidal, had bought a million copies of 4:44 and provided subscribers free downloads of the album. By the end of 2017, the album had accumulated 639,000 album-equivalent units in the United States, with 399,000 being pure sales, not including the 1,000,000 given away. In 2017, 4:44 was ranked as the 36th most popular album of the year on the Billboard 200. Credits adapted from digital booklet. "The Story of O.J." contains elements and excerpts from "Four Women", written and performed by Nina Simone; elements from "Kool Is Back", performed by Funk Inc.; and excerpts from "Kool Back Again", written by Gene Redd and Jimmy Crosby and performed by Kool & the Gang. "Caught Their Eyes" contains a sample and excerpts from "Baltimore", written by Randy Newman and performed by Nina Simone; and uncredited excerpts from Joseph N. Welch at the Army–McCarthy hearings. "4:44" contains a sample of "Late Nights and Heartbreak", written by Kanan Keeney and performed by Hannah Williams and The Affirmations and contains an uncredited interpolation from "(At Your Best) You Are Love" written by Ernie Isley, Marvin Isley, Chris Jasper, Rudolph Isley, O'Kelly Isley Jr. and Ronald Isley and performed by The Isley Brothers. "Bam" contains elements from "Bam Bam", written by Winston Riley and Ophlin Russell and performed by Sister Nancy; and elements from "Tenement Yard", written by Jacob Miller and Roger Lewis and performed by Jacob Miller. "Marcy Me" contains elements from "Todo o Mundo e Ninguém", written by José Cid and Tozé Brito and performed by Quarteto 1111; and an uncredited interpolation of "Unbelievable", performed by The Notorious B.I.G..
"Blue's Freestyle / We Family" contains elements and portions of "La Verdolaga", written by Sonia Bazanta and performed by Totó la Momposina. "MaNyfaCedGod" embodies portions of "Pillow Talk", written by Sylvia Robinson and Michael Burton and performed by Sylvia Robinson, and of "Going in Circles", written by Jerry Peters and Anita Poree, and performed by Dwight T. Ross; and an uncredited interpolation of "Partition", written by Terius Nash, Dimitri Jay, Beyoncé, Justin Timberlake, Timothy Mosley, Jerome Harmon, Dwane Weir and Mike Dean, and performed by Beyoncé. By July 2, the album was offered as a free download, sponsored by Sprint, via the website 444.tidal.com. Those album downloads—which were free to the consumer but purchased by Sprint for distribution—were counted by the RIAA towards the Platinum certification. Roc Nation told Billboard that the certification reflects those 1 million downloads, and no streams were applied towards the certification. ^ a b Caulfield, Keith (July 4, 2017). "JAY-Z's '4:44' Certified Platinum Following Sprint Promotion". Billboard. Retrieved July 4, 2017. ^ a b O'Connor, Roisin (June 30, 2017). "JAY-Z has finally addressed rumours he cheated on Beyonce". The Independent. Retrieved July 1, 2017. ^ Trakin, Roy (June 6, 2017). "Is Jay Z's New Album Being Teased With '4:44' Ads?". Variety. Retrieved July 8, 2017. ^ "Does This Mysterious 4:44 Ad Mean a New Jay Z Album Is Coming?". Complex. June 6, 2017. Retrieved July 8, 2017. ^ "Fans Speculate Jay Z Is Behind '4:44' Ads in New York". NBC New York. Retrieved July 8, 2017. ^ Barry, Peter A. "Tidal Teases '4:44' Visual Starring Mahershala Ali – XXL". XXL. Retrieved June 19, 2017. ^ "JAY-Z "Adnis"". YouTube. June 18, 2017. Retrieved June 19, 2017. ^ Blistein, Jon. "Jay Z Details New Album '4:44'". Rolling Stone. Retrieved June 19, 2017. ^ a b Lamarre, Carl. "What's Going on With All These JAY-Z '4:44' Commercials?". Billboard. Retrieved June 29, 2017. ^ a b c d e Leight, Elias. "'4:44' Producer No I.D. Talks Pushing Jay-Z, Creating '500 Ideas'". Rolling Stone. Retrieved July 1, 2017. ^ a b c Coscarelli, Joe (July 1, 2017). "The Man Behind the Music for Jay-Z's Intimate '4:44'". The New York Times. Retrieved September 2, 2017. ^ Mench, Chris (August 18, 2017). "JAY-Z Sits Down For An In-Depth Interview About '4:44'". Genius. Retrieved August 18, 2017. ^ a b c Breihan, Tom (June 30, 2017). "Jay-Z '4:44' Review". Stereogum. Retrieved July 1, 2017. ^ "Jay Z Previews New Verse From Upcoming 13th Studio Album". HipHopDX. June 19, 2017. Retrieved June 20, 2017. ^ Campbell, Kambole (July 25, 2017). "Love, truth and honesty: has Jay-Z's vulnerable new album changed hip-hop?". The Guardian. Retrieved September 2, 2017. ^ a b Kellman, Andy. "4:44 – Jay-Z". AllMusic. Retrieved July 7, 2017. ^ Cummings, Moriba. "Watch: The Clark Sisters React to Jay-Z and Beyoncé Sampling Their Music on '4:44'". BET. Retrieved July 8, 2017. ^ Lisa Respers France (July 4, 2017). "Jay-Z's '4:44' is even better than you thought". CNN. Retrieved September 2, 2017. ^ "4:44 Inspired By Tidal". Retrieved September 2, 2017. ^ Flanagan, Andrew (July 5, 2017). "Let's Unpack Jay-Z's '4:44'". KNPR. NPR. Retrieved September 2, 2017. ^ "13 Things We Now Know About Jay-Z After '4:44'". BET. June 30, 2017. Retrieved September 2, 2017. ^ a b c d e f g Leight, Elias; Reeves, Mosi; Shipley, Al (June 30, 2017). "Jay-Z's '4:44': A Track-by-Track Guide". Rolling Stone. Retrieved July 1, 2017. ^ a b c d Pearce, Sheldon (July 5, 2017). "JAY-Z: 4:44". Pitchfork. Retrieved July 5, 2017. ^ McDermott, Maeve (June 30, 2017). "'4:44' is JAY-Z's explosive response to Beyoncé's 'Lemonade'". USA Today. Retrieved August 27, 2017. ^ Khal (June 30, 2017). "Jay Z's Song "4:44" Is His Answer to Beyoncé's 'Lemonade'". Complex. Retrieved August 27, 2017. ^ Vain, Madison (June 30, 2017). "JAY-Z Swears Off Alleged Mistress 'Becky' for Good: 'Let Me Alone'". Entertainment Weekly. Retrieved June 30, 2017. ^ a b Beaumont-Thomas, Ben (June 30, 2017). "Jay-Z addresses Beyoncé infidelity rumours on new album 4:44". The Guardian. Retrieved July 1, 2017. ^ a b Lockett, Dee. "The Complete Guide to Jay-Z's New Album 4:44". Vulture. Retrieved June 30, 2017. ^ Thompson, Desire (June 30, 2017). "JAY-Z's '4:44' Addresses Falling Out With Kanye West". Vibe. Retrieved July 1, 2017. ^ Empire, Kitty (July 2, 2017). "Jay-Z: 4:44 review – now for his side of the story..." The Guardian. Retrieved August 27, 2017. ^ Greene, Leonard (June 30, 2017). "JAY-Z gets real about race relations, gentrification in Brooklyn on 'The Story of O.J.'". New York Daily News. Retrieved August 28, 2017. ^ Kreps, Daniel (June 30, 2017). "Jay-Z's Mother Comes Out on '4:44' Song 'Smile'". Rolling Stone. Retrieved August 27, 2017. ^ "'Smile'". Pitchfork. June 30, 2017. Retrieved June 30, 2017. ^ Mastrogiannis, Nicole. "JAY-Z Explains '4:44' Song Meanings". iHeartRadio. Retrieved September 2, 2017. ^ "Top 40 Rhythmic Future Releases". All Access. Archived from the original on July 8, 2017. Retrieved July 8, 2017. ^ "Top 40 Rhythmic Future Releases – R&B Song and Hip-Hop Music Release Dates – ..." All Access. September 27, 2017. Retrieved October 4, 2017. ^ "Urban/UAC Future Releases – R&B, Hip Hop, Release Schedule and Street Dates – ..." All Access. September 27, 2017. Retrieved October 4, 2017. ^ "BBC – Radio 1 – Playlist". BBC Radio 1. January 26, 2018. Archived from the original on January 29, 2018. Retrieved January 30, 2018. ^ Kreps, Daniel. "Jay-Z Announces Massive North American '4:44' Tour". Rolling Stone. Retrieved July 10, 2017. ^ "The Story of O.J." Tidal. Retrieved June 30, 2017. ^ "Jay-Z Releases Animated 'The Story of O.J.' Video From '4:44'". Rolling Stone. Retrieved June 29, 2017. ^ Yoo, Noah (July 7, 2017). "JAY-Z Releases New "4:44" Video: Watch". Pitchfork. Retrieved December 25, 2017. ^ Wicks, Amanda (July 14, 2017). "JAY-Z Shares New "Bam" Video with Damian Marley: Watch". Pitchfork. Retrieved December 25, 2017. ^ Kim, Michelle (July 21, 2017). "Watch JAY-Z's New "Kill Jay Z" Video". Pitchfork. Retrieved December 25, 2017. ^ Wicks, Amanda (July 28, 2017). "Mahershala Ali and Danny Glover Star in JAY-Z's New "Adnis" Video: Watch". Pitchfork. Retrieved December 25, 2017. ^ Yoo, Noah (August 4, 2017). "JAY-Z's New Video Is a Black "Friends" Remake: Watch". Pitchfork. Retrieved December 25, 2017. ^ Wicks, Amanda (August 11, 2017). "Lupita Nyong'o Stars in New JAY-Z and James Blake Video: Watch". Pitchfork. Retrieved December 25, 2017. ^ Wicks, Amanda (November 24, 2017). "JAY-Z Shares 3 New Videos: Watch". Pitchfork. Retrieved December 25, 2017. ^ Wicks, Amanda (December 29, 2017). "JAY-Z and Beyoncé Go to Confession in New "Family Feud" Video: Watch". Pitchfork. Retrieved December 29, 2017. ^ Kim, Michelle (January 7, 2017). "Watch JAY-Z's New Animated "Blue's Freestyle" Video". Pitchfork. Retrieved January 10, 2017. ^ Wicks, Amanda. "JAY-Z Announces 4:44 Listening Parties". Pitchfork. Retrieved June 30, 2017. ^ Brandle, Lars. "Jay Z Announces New Album '4:44' For June 30". Billboard. Retrieved June 19, 2017. ^ ". @S_C_'s '4:44' where I talk about the things that I've never talked aboutavailable exclusively to TIDAL and @Sprint customers on 6/30". Twitter. June 26, 2017. Retrieved June 28, 2017. ^ Mastrogiannis, Nicole. "JAY-Z Explains '4:44' Song Meanings iHeartRadio Album World Premiere". iHeartRadio. Retrieved June 29, 2017. ^ Kim, Michelle. "New JAY-Z Album 4:44 Getting Physical Release". Pitchfork. Retrieved July 1, 2017. ^ Greenburg, Zack O'Malley (July 7, 2017). "Jay-Z's '4:44' Is Now on Apple And Amazon, Revealing A Lucrative Tidal-Sprint Bluff". Forbes. Retrieved July 7, 2017. ^ "4:44 by Jay-Z reviews". AnyDecentMusic?. Retrieved July 7, 2017. ^ a b "Reviews and Tracks for 4:44 by JAY-Z". Metacritic. Retrieved June 30, 2017. ^ Purdom, Clayton (July 6, 2017). "JAY-Z finds his third act on 4:44". The A.V. Club. Retrieved July 8, 2017. ^ a b c McCormick, Neil (June 30, 2017). "Jay Z has delivered one of the most mature albums in hip hop history – 4:44, review". The Daily Telegraph. Retrieved June 30, 2017. ^ Emery, Andrew (June 30, 2017). "Jay-Z: 4:44 review – a bracingly honest but conservative confessional". The Guardian. Retrieved June 30, 2017. ^ Milton, James (June 30, 2017). "Jay Z – '4:44' Review". NME. Retrieved June 30, 2017. ^ Empire, Kitty (July 2, 2017). "Jay-Z: 4:44 review – now for his side of the story…". The Observer. Retrieved January 9, 2018. ^ Reeves, Mosi (July 5, 2017). "Review: Jay-Z Is Vulnerable, Apologetic and Still Dazzling on '4:44'". Rolling Stone. Retrieved July 6, 2017. ^ Christgau, Robert (July 14, 2017). "Robert Christgau on JAY-Z's '4:44,' Vince Staples 'Big Fish Theory,' and More". Vice. Retrieved July 21, 2017. ^ Coscarelli, Joe (June 30, 2017). "Jay-Z Releases His Personal and Political Album '4:44' on Tidal". The New York Times. Retrieved August 30, 2017. ^ "Jay-Z gets personal and deep on new album '4:44'". Chicago Tribune. June 30, 2017. Retrieved August 30, 2017. ^ Spanos, Brittany. "How Jay-Z's '4:44' and Beyonce's 'Lemonade' Redefine Black Love, Fame". Rolling Stone. Retrieved June 30, 2017. ^ "2017 Top Ten Albums Of The Year". Artist Direct. December 22, 2017. Retrieved December 30, 2017. ^ "Best of 2017: The Associated Press names SZA's 'Ctrl' album of the year". Associated Press. December 30, 2017. Retrieved December 30, 2017. ^ "The 10 Best Albums Of 2017, Ranked". The Atlantic. December 12, 2017. Retrieved December 12, 2017. ^ "The 50 Best Albums Of 2017". Billboard. December 12, 2017. Retrieved December 12, 2017. ^ "The Best Albums Of 2017". Complex. December 6, 2017. Retrieved December 6, 2017. ^ "Top 50 Albums of 2017". Consequence of Sound. November 27, 2017. Retrieved November 27, 2017. ^ "These are the best albums of 2017". Cult MTL. December 22, 2017. Retrieved December 22, 2017. ^ "The 25 Best Albums Of 2017". Entertainment Weekly. December 6, 2017. Retrieved December 6, 2017. ^ Miller, Matt (December 30, 2017). "The Best Albums of 2017". Esquire. Retrieved December 30, 2017. ^ "Exclaim! 's Top 10 Hip-Hop Albums". NME. December 5, 2017. Retrieved December 15, 2017. ^ "The 20 Best Albums Of 2017". Fuse. December 8, 2017. Retrieved December 8, 2017. ^ "The 30 Best Albums of 2017". The Independent. December 5, 2017. Retrieved December 5, 2017. ^ "Best albums of 2017". Newsday. December 30, 2017. Retrieved December 30, 2017. ^ "The 17 best albums of 2017: Kendrick Lamar, Lorde and other favorites". Newsweek. December 30, 2017. Retrieved December 30, 2017. ^ "The 50 Best Albums Of 2017". NPR. December 12, 2017. Retrieved December 12, 2017. ^ "People Picks The 10 Best Albums of 2017". Pitchfork. December 30, 2017. Retrieved December 30, 2017. ^ "Rap-Up's 20 Best Albums of 2017". Pitchfork. December 30, 2017. Retrieved December 30, 2017. ^ "The Best Albums Of 2017, Ranked". The Ringer. December 6, 2017. Retrieved December 6, 2017. ^ "50 Best Albums Of 2017". Rolling Stone. December 5, 2017. Retrieved December 5, 2017. ^ "The 25 Best Albums Of 2017". Slant Magazine. December 7, 2017. Retrieved December 7, 2017. ^ "All The Best Albums Of 2017, Ranked". Uproxx. December 5, 2017. Retrieved December 5, 2017. ^ "The 30 Best Albums of 2017". Vinyl Me, Please. Retrieved December 6, 2017. ^ a b Caulfield, Keith (July 16, 2017). "JAY-Z Scores 14th No. 1 Album on Billboard 200 Chart With '4:44'". Billboard. Retrieved July 17, 2017. ^ a b Savage, Mark (July 6, 2017). "Did Jay-Z's 4:44 really sell a million copies in five days?". BBC. Retrieved August 30, 2017. ^ "2017 U.S. Music Year-End Report". Nielsen SoundScan. Retrieved January 6, 2018. ^ a b c d Ortiz, Edwin. "Here Are the Samples Used on Jay Z's '4:44'". Complex. Retrieved August 30, 2017. ^ "Australiancharts.com – Jay-Z – 4:44". Hung Medien. Retrieved July 15, 2017. ^ "Austriancharts.at – Jay-Z – 4:44" (in German). Hung Medien. Retrieved July 20, 2017. ^ "Ultratop.be – Jay-Z – 4:44" (in Dutch). Hung Medien. Retrieved July 14, 2017. ^ "Ultratop.be – Jay-Z – 4:44" (in French). Hung Medien. Retrieved July 28, 2017. ^ "Jay-Z Chart History (Canadian Albums)". Billboard. Retrieved July 17, 2017. ^ "Czech Albums – Top 100". ČNS IFPI. Note: On the chart page, select 201728 on the field besides the word "Zobrazit", and then click over the word to retrieve the correct chart data. Retrieved July 18, 2017. ^ "Danishcharts.dk – Jay-Z – 4:44". Hung Medien. Retrieved July 19, 2017. ^ "Dutchcharts.nl – Jay-Z – 4:44" (in Dutch). Hung Medien. Retrieved July 14, 2017. ^ "Le Top de la semaine : Top Albums – SNEP (Week 28, 2017)". Syndicat National de l'Édition Phonographique. Retrieved July 18, 2017. ^ "Offiziellecharts.de – Jay-Z – 4:44" (in German). GfK Entertainment Charts. Retrieved July 14, 2017. ^ "Irish-charts.com – Discography Jay-Z". Hung Medien. Retrieved July 15, 2017. ^ "Album – Classifica settimanale WK 28 (dal 2017-07-07 al 2017-07-13)" (in Italian). Federazione Industria Musicale Italiana. Retrieved July 15, 2017. ^ "Charts.org.nz – Jay-Z – 4:44". Hung Medien. Retrieved July 14, 2017. ^ "Norwegiancharts.com – Jay-Z – 4:44". Hung Medien. Retrieved July 15, 2017. ^ "Oficjalna lista sprzedaży :: OLiS - Official Retail Sales Chart". OLiS. Polish Society of the Phonographic Industry. Retrieved July 27, 2017. ^ "Portuguesecharts.com – Jay-Z – 4:44". Hung Medien. Retrieved August 2, 2017. ^ "Official Scottish Albums Chart Top 100". Official Charts Company. Retrieved July 15, 2017. ^ "Spanishcharts.com – Jay-Z – 4:44". Hung Medien. Retrieved July 20, 2017. ^ "Swedishcharts.com – Jay-Z – 4:44". Hung Medien. Retrieved July 14, 2017. ^ "Swisscharts.com – Jay-Z – 4:44". Hung Medien. Retrieved July 19, 2017. ^ "Jay-Z entre directement en première position" (in French). lescharts.ch. Retrieved February 13, 2018. ^ "Official Albums Chart Top 100". Official Charts Company. Retrieved July 15, 2017. ^ "Jay-Z Chart History (Billboard 200)". Billboard. Retrieved July 18, 2017. ^ "Jay-Z Chart History (Top R&B/Hip-Hop Albums)". Billboard. Retrieved July 18, 2017. ^ "American album certifications – Jay-Z – 4:44". Recording Industry Association of America. If necessary, click Advanced, then click Format, then select Album, then click SEARCH. ^ April Clare Welsh (July 2, 2017). "Download Jay-Z's new 4:44 album for free now". Fact. Retrieved September 2, 2017. ^ Burgess, Omar (July 2, 2017). "You Can Now Download Jay Z's '4:44' for Free via Tidal with No Subscription". Complex. Retrieved September 2, 2017.